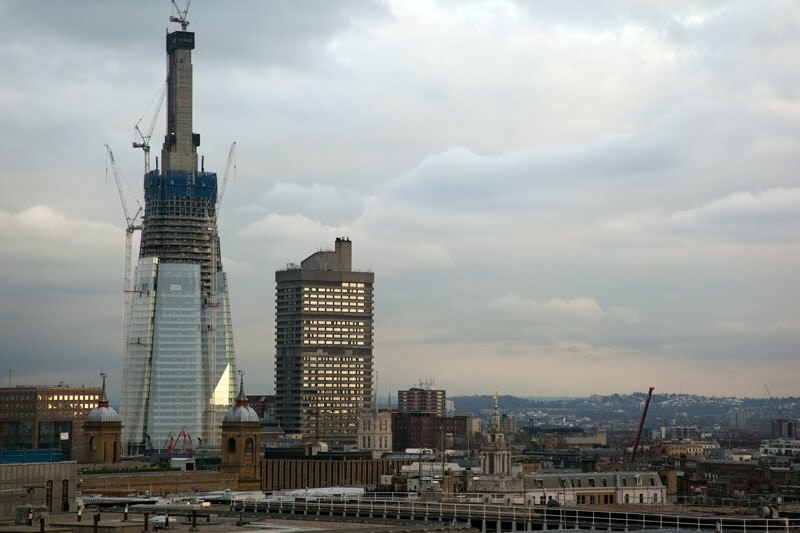 A bird's eye view of progress on the Shard. It started life as London Bridge Tower, designed by Renzo Piano, the Italian architect who also designed the Pomidou Centre in Paris. Controversial, loved by some hated by others. It will change London's skyline, becoming the tallest building in the European Union and the 45th highest in the world. Currently scheduled to be finished in 2012. I'm cynical about this building. I'd suggest it will be unsafe to work in (impossible to escape from in a fire) and it shouts unpleasantly to the world that the architect is showing off. If only all new structures in London could be as graceful as The Eye. onore a Renzo Piano ,ma londra aveva proprio bisogno di questo edificio ?.......non so.ciao Elisabetta. Didn't know about it. Thanks Mo. Glad you are keeping us updated on the progress. The last time I was there, I remember this just a proposal. I saw an artist's rendition of the finished tower. I suppose it is supposed to look like a shard of glass when it's finished. It doesn't have the presence of St Paul's or the Houses of Parliament. I'm not sure I like it...whatever happened to blending in??? I'll reserve judgement to the end but it doesn't look to great now! The first thing I thought of was it reminded me of a Dalek from Dr. Who. But, what do I know? I'm not an architect. LOL! I must admit I'm not sure about this. I've seen the artist's impression and I'm not sure it fits in with the rest of the skyline. Will have to wait and see the finished building. I do love The Gherkin though, that looks great on the london skyline. My opinion will have absolutely no effect on anything, so I will reserve it. But, I will note that when I heard that I.M. Pei was putting a glass pyramid in the courtyard of the Louvre, I was outraged, and yet now it looks like it was always supposed to be there. Maybe my first opinion was dead wrong . . .
Bring back the Luftwaffe I say! I'm one of the lovers. Oooh, interesting news that it is once again meant to be the highest in the EU since the Federation Tower was put on hold. For what it is worth, I am a big fan of this building also. Part of this development will be the complete overhaul of London Bridge station, which is London's oldest (1836) and for the first-time visitor, one of the most confusing transport hubs with its two Underground exits and curious mixture of terminus and through-platforms. This, and the changes to the bus station will make navigating the area so much easier, but unfortunately not until after the Olympics. As for the Shard itself, this is a mixture of offices at lower level, hotel and viewing platform at mid-level and residential in the top, smaller floors, all sited at a major bus/train/tube interchange. I already enjoy the way the inclined glass reflects London's ever-changing sky and am looking forward to its final shape echoing the church spires below, for example, that of St. George's on Borough High Street. And then we will have but the latest example of what London does better than any other city I can think of: embracing the new and juxtaposing it with the old to create a dynamic, inspiring, humbling environment promoting energetic, creative, innervating activity and ideas. There was a time when Inigo Jones's Banqueting House faced hostility for being too radical and bringing alien ideas from Continental Europe. Similarly his Covent Garden Piazza, the first square in London, using an idea that had been commonplace elsewhere for some time (based on the square in Livorno). This example of a vertical city at a transport hub may be a first for the UK but has been part of architectural thinking and urban planning elsewhere for decades.